A hidden history with far-reaching consequences – from the dream of a New Jerusalem to the shores of The New World. Every schoolchild knows the story of how America began: the Puritans set sail on the Mayflower in 1620, landed at Plymouth Rock… and the rest is history. raises provocative questions – Were the Templars looking for a new Atlantis? Was the Constitution a Freemasonic coup? Did the Civil War mean decisive victory for the Freemasons? Are t, oday’s leaders under their influence too? Nicholas Hagger has written more than forty books. 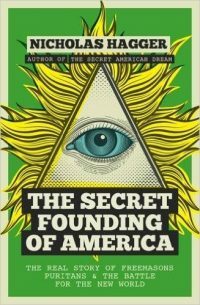 The Secret Founding of America is the first in his American Trilogy followed by The Secret American Dream and The Secret American Destiny. Many have remarked that there is something we don’t know about the Jamestown settlement which was responsible for the strange divisions and factionalism among the settlers. (Dr William Kelso, the discoverer of Jamestown, has been very exercised by this, and has looked for explanations involving Spain and internecine warfare, with some settlers shooting and possibly poisoning others, behaviour inconsistent with that of settlers who are all in the same boat.) Nicholas Hagger’s research, conducted with a completely open mind, has offered a possible solution to this bizarre factionalism – hence the Freemasonic thread alongside the Christian one. Hagger is trying to give a consistent account of the 16th/17th century planting of the New World and 18th century founding of the United States that answers all the questions that still bother people who look into the establishment of America, and which is consistent with subsequent developments in the 19th/20th centuries and today. His book gives a consistent, coherent explanation for events that have never been fully explained and makes sense of all aspects of the planting and founding of America. Nicholas Hagger’s books reveal truths that have been hidden, and are rewarding. He has devoted much thought to unearthing the pattern of history, and he presents a new approach to the founding of the USA and to the workings of the American State.